Blind fury of shiotts left little space for peace and joy in Eviron. The pain and fear for a long time were the only companions of this magic universe, till the Niars were able to seal the passageways between the worlds with the help of powerful artifacts: Prisms of Light. A lot of years have passed since that time. The delicate balance between Light and Darkness was restored, but each new day was stretched in painful anticipation of imminent battle. Who knows, maybe in this tense moment, your summoning here will mark a new chapter in the annals of the world? Perhaps it is you will become a thereby savior. May be your brilliant mind, grant you the laurels of the greatest tactics. Or you’ll become autocratic dictator, whose purpose to make the chaos, destruction and death everywhere? The choice is yours! At your disposal there are six unique commanders. Each General is a faithful servant of current ancient element. Mighty tactics and experienced strategists will not only lead your army and help in the difficult struggle, but also teach you to control the ancient magic tricks. Over the years of their travels across the lands of Eviron Generals mastered the secret knowledge and comprehend the incredible strength. With their help you will be ready for each, even the most epic, feat. More than 200 unique cards with different warriors and spells will help you to overcome absolutely all obstacles on the way to victory! The only condition required to plunge into the maelstrom of dizzy and fantastic events is connection to the Internet. There is no need to download a client or to buy the disc. Besides, you can do without Flash Player. So you will be able to enjoy the game from almost any vantage point with your favorite gadget. Mobile phone or tablet, PC or notebook - Eviron will always be at your fingertips! The creators of the Game were inspired by the best samples of world known CCG to give you real pleasure from the trip to this fascinating universe. Fanats of classic collectible card games and just hunters to new experiences will find in the world Eviron something what they like. Great illustrations, original tasks, lots of daily quests and exciting game modes, monsters, heroes and the deadly struggle – this is Eviron. You will always wait something new and exciting! Welcome to Eviron! Assemble the squad of mighty and rare creatures, keep ready the most dangerous spell, consider your unbeatable strategy and go in search of glory in one of the most memorable adventures in life! 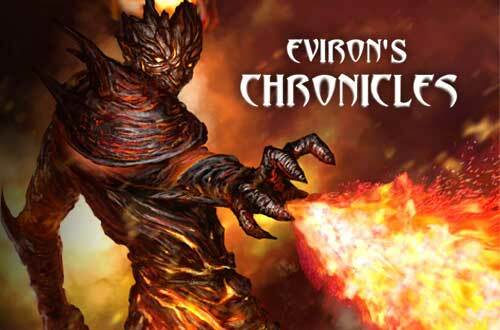 Eviron’s Chronicles warmly welcome you!